Spent Saturday morning at the ASA AGM at the beautiful State Library in Sydney. 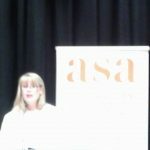 The ASA provides fabulous services for authors in terms of everything from legal help with contracts to opportunities to learn about various aspects and genres of writing – so to any aspiring writers ‘out there’ do think of joining the ASA. We also welcomed new directors to the Board, Anne-Marie Nicolson and Kirsty Murray. The Colin Simpson lecture was given by the fabulous and internationally published Jacqueline Harvey, best known for her Alice Miranda series (soon to become a movie) and also Clementine Rose plus the new mystery series she’s currently writing. Her topic, Gender, Gate-keepers and good fun in children’s literature centred around problems she’s encountered from some teachers, book shops and librarians who consider her books ‘for girls only’ whereas her books, she says, are for all children because they are ‘good stories’. While quoting statistics about boy and girl characters in books and their relative recognition and popularity, Jacqueline made the very good point that while girls willingly read ‘books for boys’ the same could not be said for boys reading ‘books for girls’, and she deplored that, saying that it might help to ‘socialise’ boys if they did so. (I’m paraphrasing here so I hope I’m not misquoting or misunderstanding her message!) While gender bias is a fascinating question that exercises the minds of children’s writers, there are, of course, other considerations to take into account – not least thinking about levels of violence, sexual activity, racism and inclusion, and other assorted topics when it comes to writing for kids. I’d be interested to hear your thoughts on any of this. Apologies for the poor quality of the accompanying photo, courtesy of my mobile phone.